Every galactic bounty hunter needs to get a start somewhere, right? Think about it. One doesn’t become a big, bad, strong villain who strikes fear in the hearts of all galaxy dwellers, just like that. Learning how to be mysterious, silent and how to live by a secret code of bounty hunter honor requires lots of training, and we mean LOTS. Does your child have what it takes to survive tussles with the likes of Luke Skywalker and keep the boss of the Empire happy? 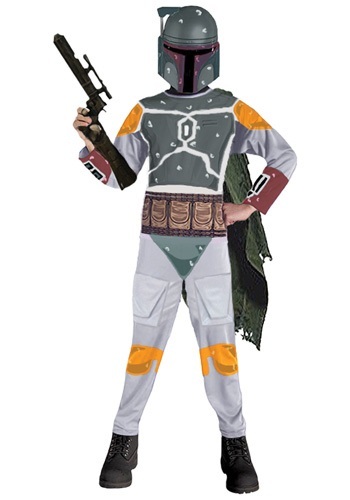 Well, you’ll find out by dressing up your trooper in this Boba Fett Halloween costume, which has been copied from the famous Star Wars character’s duds to the last detail. The mask conceals identity, which is important when you’re staying out of the limelight. The rugged-looking jumpsuit has printed armor that looks just Boba Fett’s real thing to appear legit intimidating. There’s even a printed ammo belt around the waist so they'll look loaded up and ready to chase down sneaky outlaws from one end of the galaxy to the other! And what would a super-villain be without a cape? Don’t worry, this costume has one that hangs off the left shoulder in a dashing way, too. It's everything any boy or girl needs to start their Star Wars adventure. Because Jabba the Hutt and Darth Vader are waiting for them to deliver on their promises this Halloween!